Oracle inventory main reporting tables. Base table for all transactions (etc RCV,Issuance,Sub Inv Transfer,Inter Org Transfer,Misl Transactions…). Table contains all System items organization wise. It is Base table for items. This table holds the definitions for inventory items, engineering items, and purchasing items. The flexfield code is MSTK. The primary key for an item is the INVENTORY_ITEM_ID and the ORGANIZATION_ID. The same item could be defined in more than one organization. Each row represents an item in an organization. Table contains translated description of each master item. 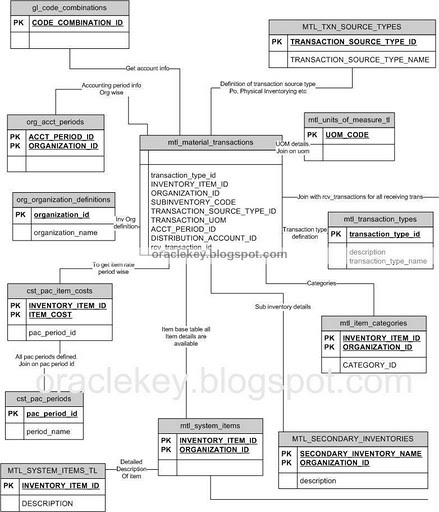 The primary key is INVENTORY_ITEM_ID, ORGANIZATION_ID and LANGUAGE. Stores valid Accounting Flexfield segment value combinations for each accounting flexfield structure within your General Ledger. Primary key: CODE_COMBINATION_ID. This table is the definition table for the subinventory. Subinventories are assigned to items, indicating a list of valid places in which this item may be located. 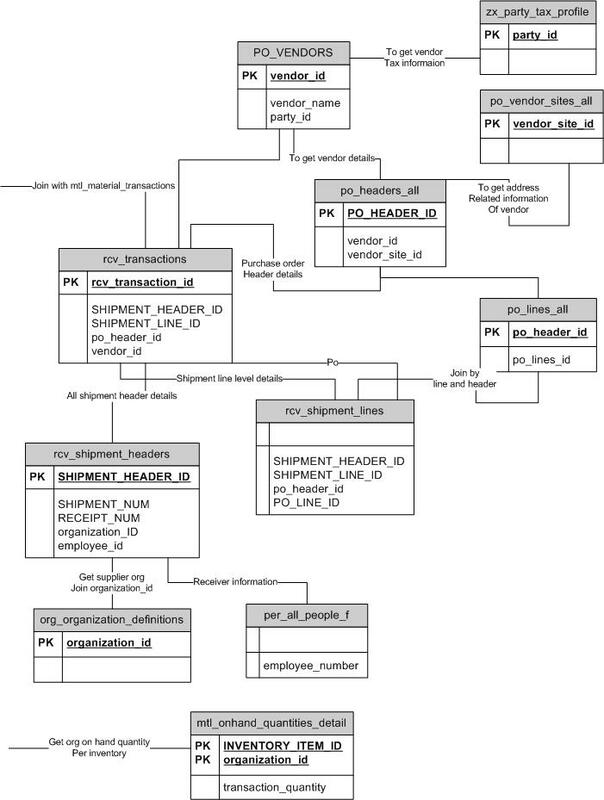 The primary key is SECONDARY_INVENTORY_NAME, ORGANIZATION_ID. This table stores the item assignments to categories within a category set. For each assignment, this table stores the item, category set, and the category. Items can be assigned to multiple categories and category sets, but can be assigned to only one category in a given category set. This table is populated through either the Define Item or the Update Item/Org Attributes forms. It can also be populated by performing item assignments when a category set is defined. The primary key is INVENTORY_ITEM_ID, ORGANIZATION_ID, CATEGORY_SET_ID. Oracle Purchasing main reporting tables. You can get data of all receiving transactions in this table. TRANSFER, RETURN TO VENDOR, RECEIVE. Get purchase order header level information from this table. TYPE_LOOKUP_CODE indicates purchase order type like RFQ, STANDARD. Get purchase order live level information from this table. ITEM_ID join with table MTL_SYSTEM_ITEMS column ITEM_ID to get item all information. Get vendor level information from this table. Get vendor sites information from this table in detail. 2. Item Creation and Updation Public API. This API used to create items. 3. Category Code Creation Public API. This API provides functionality to create a category. 5. Item Catalog Descriptive Element Public API. 6. Item Revision Creation and Updation Public API. 7. Implement Item Pending Changes Public API. This API provides functionality to implement pending changes (phase and/or status) for an item/item revision. 8. Item Lifecycle Public API. 10. Item User-Defined Attributes Data Public API. 11. Item Assignment to an Organization Public API.